Skeleton crosswords require you to work harder than with a normal crossword. That's because, unlike a normal crossword, you have to construct the grid before you can fully solve the puzzle! The aim of a skeleton crossword, then, is both to complete the pattern of the grid and then to fill it with the answers to the crossword clues provided. There are no word lengths given so you will have to construct the grid as you go along using all your crossword nous, together with the scant information that is given. 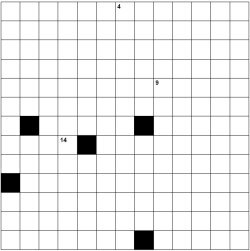 At the start of the puzzle you will be presented with a grid that looks very white, like that on the right. There are a few filled cells given to start you off, and also a few numbers. You should extract as much information from these as you possibly can to help you work out the shape of the grid, and to start filling in information on the grid. Typically you will be given a few clue numbers and also a few filled cells. The more you solve skeleton crosswords the quicker you get at solving them, and of course some are naturally harder than others. The greater the level of symmetry exhibited, the more you can fill in on the grid with each deduction that you make. Pay particular attention to clues that share the same number, and also try to work out the order of the numbers as you go along, as often this can be used to help to solve the puzzle. We can supply skeleton crosswords in a range of sizes and difficulty; puzzles are supplied in print ready PDF format with the solution and licensed for print publication; other formats can also be created on request.